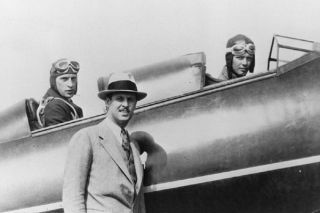 In this historical photo from the U.S. space agency, a trio of well-known aviators visting the NACA facilities in June of 1927. Fred E. Weick head of the Propeller Research Tunnel section, 1925-1929, in rear cockpit. Charles Lindbergh in front. Tom Hamilton is standing.